Star Trek Online developer Cryptic Studio is planning a tribute to Leonard Nimoy. 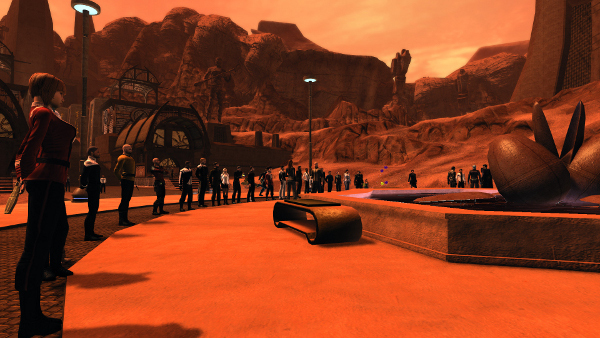 They'll be adding an memorial within their free-to-play MMORPG to the deceased Star Trek actor in a few days. "Everyone at Cryptic Studios was saddened to hear of his passing and we want to make sure we never forget the cultural impact of the man or the character he played," said executive producer Steve Ricossa on the Star Trek Online forums. "To that end, the Star Trek Online team will implement a standing in-game memorial to Spock and Leonard Nimoy this Thursday March 5th with our regular weekly maintenance." "In this way, we hope to keep his memory as alive in our game as he is in all of our hearts." The picture doesn't accurately depict just how many people assembled for the tribute. When Star Trek Online areas are crowded, the game creates several duplicates (or "instances") of that area so that there are only 15 or 20 people visible to each player. One Reddit user estimated there were about 1,000 players there across all instances. It's fitting that Nimoy would be honored in Star Trek Online. He revealed the first gameplay trailer for STO along with Cryptic Studios Chief Creative Officer Jack Emmert in a presentation back in 2008. Nimoy also provided extensive voiceover throughout the game. Star Trek Online isn't the first MMO to pay tribute to a deceased star. For example, World of Warcraft now has an memorial to Robin Williams in honor of his self-professed love for the game.